Yogurt was not common years ago in China. Yogurt has been and still eaten mainly by the upper northerners, Mongolia area or muslim population who raise sheep/goats and goat milk yogurt is quite common and traditional among them. Today many bigger cities in China are no difference to any cosmopolitan cities in the world, western style yogurt or yogurt drinks are available everywhere. I don't want to talk about goat milk yogurt or western yogurt. The topic today is an imperial palace yogurt recipe, a favourite with the Empress Dowager Cixi 慈禧太后. This is a recipe over 100 years old. It's called Imperial yogurt (gong ting nai lao 宫廷奶酪). I think cow milk was precious in China hundred years ago thus it was good enough for the royals. Gong ting nai lao is common in Beijing but I have not come across it outside China. I wonder why Cantonese ginger milk curd is common among Chinese all over the world but not gong ting nai lao. If you have a sweet tooth like mine and love this kind of custard like dessert like dou fu fa (soy milk curd), ginger milk curd, double skin custard etc.. you will like this gong ting nai lao. This imperial yogurt is similar in texture but totally different taste to Cantonese ginger milk curd. Both must use full cream milk and have none of the sour taste like normal yogurt we know. Ginger milk curd is dominantly flavoured by ginger juice and set by enzyme from the ginger juice. Imperial yogurt main ingredient other than milk is juice from fermented rice called lao zao zhi 醪糟汁. This imperial yogurt is sweet with a fragrant rice wine flavour (like sake) more delicate than ginger. The ingredients for this low alcoholic milk curd is very simple just full cream milk, lao zao zhi 醪糟汁 and extra sugar if needed. I never add sugar, I find the sweetness from the fermented rice juice is enough to sweeten to curd. This mixture is heated till the milk is set. Traditionally the milk mixture was baked in a large wood barrel heated by charcoal. There are recipes using steaming, I have tried steaming and did not like it very much, the curd separated with a thick layer of clear liquid at the bottom, I reckon the heat was too high or I overcooked it. The easiest way I find is simply bake it at low temperature. I am still curious what makes this imperial yogurt set, is it the active friendly bacteria/yeast or the alcohol in the fermented rice juice reacting with milk with the help of heat. If you have some fermented rice give this a try it's a lovely dessert. I have followed recipes I found on the internet, normal proportion of milk to fermented rice juice (lao zao zhi 醪糟汁) is 2 : 1. I find the flavour too strong and too sweet without additional sugar. I have also lower the recommended temperature of 110 deg C after a few trials and errors, I find lowering the temperature is less likely to cause the curd to separate with a layer of clear liquid underneath. This is my recommended recipe after trials and errors. Proportion of full cream milk to lao zao zhi 醪糟汁 is 3 : 1. Use freshly opened milk that does not have any hint bad milk smell. If yes the milk has already started to turn and will curdle during heating. Heat milk on the stove or microwave (I normally microwave) till milk is hot but not boiling. This is to kill any unwanted bacteria or nasties that may affect the curd. I normally make two bowls of this curd using 300 ml milk heated for about 4 minutes in the microwave on high. Cover the milk and leave to cool then sieve to remove any solids. Take some fermented rice and put on a piece muslin cloth. Wrap and squeeze out the juice. Measure required amount (100ml juice for 300ml milk). Mix cooled milk and juice together, add a bit more sugar if you like it sweeter. Stir and pour into ramekins, rice bowls or glass containers. Put in oven at about 90 deg C for about 30 minutes or till you can see the surface has set, or when lightly shake the bowl the surface will wobble. Check after 25 minutes in the oven, then every 5 - 8 minutes later. If there is more than 0.5cm layer of liquid separated on the bottom it is overcooked, try again next time with a shorter baking time. To check the layer of liquid on the bottom best use a glass ramekin. Remove from oven, cover and leave to cool. Chill in the fridge and serve. If you like a firmer yogurt add 2 - 3 tbsp milk powder per 300ml milk. Mix this in before milk is heated or when the heated has cooled to warm temperature. 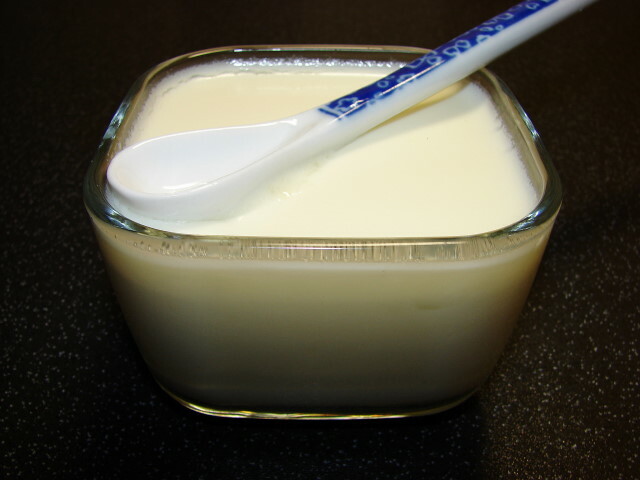 * Nai lao 奶酪 normally means cheese in Chinese but in the recipe it is a yogurt. Don't ask me why.